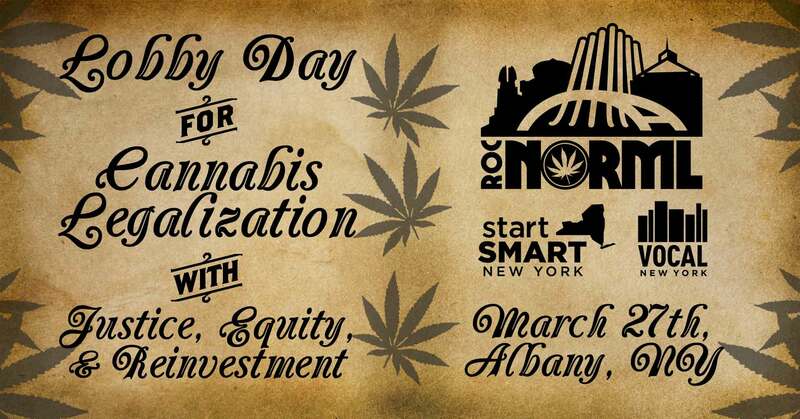 Join Roc NORML and the Start SMART NY campaign to lobby in Albany for marijuana legalization rooted in racial, economic, and social justice. As negotiations for the state budget are wrapping up, help us tell the Legislature and Governor that marijuana legalization in New York MUST create equity, economic justice, and work to restore communities most damaged by this country’s failed war on drugs. We must also fight to make sure the rights of consumers are protected, in that legislation must include provisions for home cultivation with community gardens and allowance for on-site public consumption. We will meet up at 5:30 AM at House of Mercy (285 Ormond St.) on Wednesday, 3/27 to board the bus. We will depart Albany by 4 PM to return to Rochester. Transportation and lunch costs will be covered. Please RSVP using this link (if you haven’t already)! 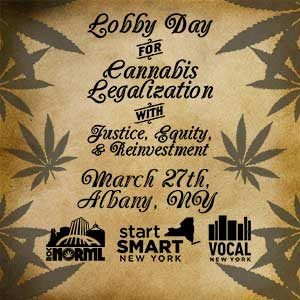 RSVP for "March 27th Cannabis Justice Lobby Day"